What The Heck Was This Postcard Artist Thinking? I don’t even know where to start commenting this antique image is so disturbing. Certainly an early image of child abuse. 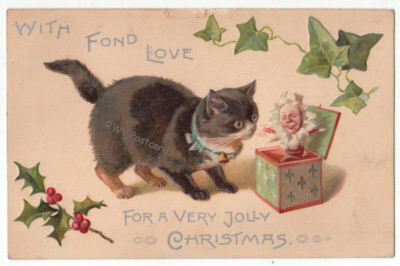 Yikes, what was the exaggeration postcard artist thinking??? 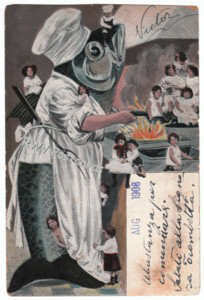 It’s again Postcard Friendship Fridays at The French Factrice blog. This is an event, hosted by Marie, where postcard collectors share an example of what they feel is “postcard perfect”. It’s a great way to show why this hobby is so fun. 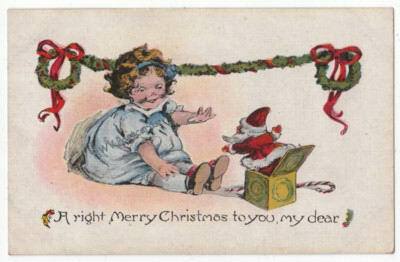 This week, I’m sharing two postcards featuring the children’s toy, the Jack-In-The-Box. The first wind-up toys were made in Grecian times. The art of making this type mechanical toy was revived in the 1400’s by watch and clock makers, with versions based on clocks which had a bird “popping” out. Another theory regarding this wind-up toy’s origins has it evolving from captured runaway black slaves, or “Jacks”, put in wooden boxes. Children playing around these boxes, would poke sharpened wooden sticks though the knotholes. The Jack inside would yelp, often busting through the box’s top. If this theory were true, it makes me wonder how many parents would have let their children play with such a toy had they known it was based on mistreatment of a human being. ** Remember to hop on over to Marie’s and check out all the postcard enthusiasts sharing this week.